Whether you need flexible talent for short-term needs or projects, or you need to fill critical openings on your team, finding exceptional talent has never been more difficult, time-consuming, expensive, and frustrating. In this presentation you'll learn the right questions to ask to find the right staffing agency to help you meet your talent needs. How strong is the agency's recruiting reach? Does the staffing agency specialize in the talent you require? How well does the agency screen and assess candidates? 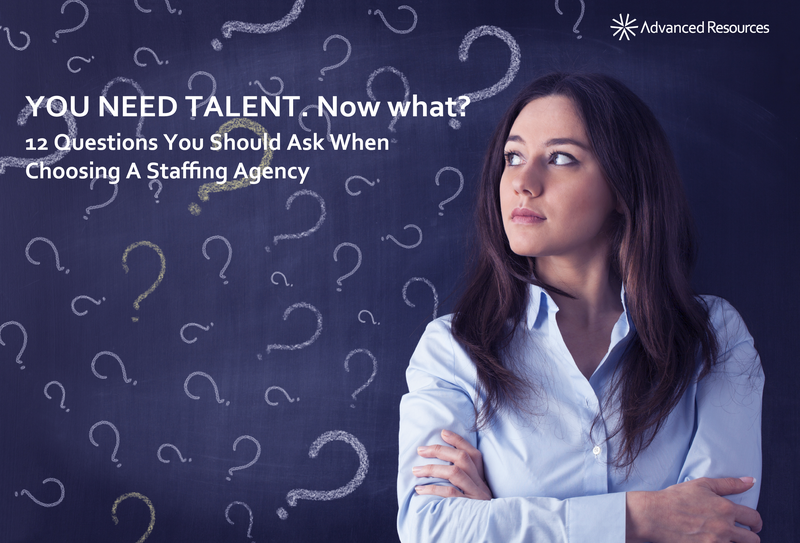 And 9 more important questions to ask when choosing a staffing agency! Available as a free download here! Here are 12 questions you should ask to find the one that’s right for you. Advanced Resources is Chicagoland's top award-winning choice for HR, technology, accounting & finance, healthcare, and office support talent. Find out more atwww.advancedresources.com or contact us now!